When I first pitched this idea to Alec in December, it seemed obvious that we should do it. 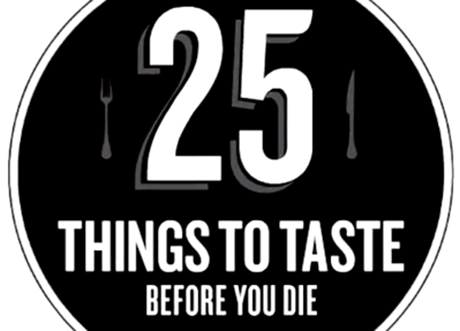 Consume all of Vanmag’s “25 things to taste before you die” in one day. It sounded like an all too perfect follow-up to our Porchetta Crawl. But after we had gone through the logistics and planning, we were both beginning to have our doubts. It felt about 6 meals and 10 locations too far. Even if it was possible to fit that much food in, could we actually make it to all our spots around the city before they closed? The answer is one click away. The stars of the show were definitely Fable’s Duck meatball and Suika’s Snackbar’s Rib Steak. But both restaurants delivered a second offering that was even tastier. The Canned Tuna that Trevor Bird concocted was nothing like we had ever tasted, reminiscent of a delicate tuna nicoise. Suika’s sweet sensation of a Short Rib fell off the bone and into our mouths so quickly, I’m glad we had one on our research trip. On the sweet front, Cadeaux Bakery and Chocolate Arts more than delivered, providing the necessary sugar rush to jumpstart our day. One of the biggest surprises on the tour was Sofra’s Pide with their pomegranate beef turkish pizza with a fried egg on top, perfect for any breakfast, lunch or dinner. Woodland Smokehouse’s light and flaky jalapeño sausage roll redefined an old classic. And Nine Dishes provided not only the fastest and coldest beer, but a spicy sichuan cold chicken dish which easily trumped the sausage on the original list. On the drink front, Jay Jones worked his magic, transforming Belvedere IX (a vodka that should have never happened) into the amazing Silk Purse. He then elevated PokPokSum’s Pineapple drinking vinegar to new heights in his Dos Piñas, videos for both are forthcoming. Matt Martin formally from the now closed Fat Dragon BBQ, brought back his JunMai Sour for us to sample at the Cascade Room, a tasty pink pearl of a drink that we hope will hit their regular menu. It’s not often, or ever that you get a chance to vet an entire top 25 of anyone’s list. Although while we were left scratching our head on a few of the picks on the list, the discoveries we made along the way, made our Vancouver gastronomic journey simply amazing. It is a testament to the city we live in, that we have so many great food and beverage items to sample in just one day. Or more. Or less. Let’s hope Vanmag doesn’t release a top 100 this year. Burp. Gourmet vs Gourmand is a web series of culinary adventures shared by Alec and Johnathon. Over the past few years, the eating duo have ploughed through Choucroute at Le Crocodile, trekked through the wilds of North Carolina and West Broadway in search of BBQ, buried a lamb barbacoa in Alec’s backyard and gotten Lost in Robson’s Koreatown culture of meat and Karaoke. They are currently planning their next quest, GvsG: 8 1/2 Pizzas, due out this June.